Vacation rental house. Sleeps 8, 4 bedrooms, 1.75 bathrooms. Cats, Dogs allowed. Here we see the Klebenov Mittersill Village Chalet dressed for Winter. All that the Franconia Notch State Park has to offer IS the back yard for this place. Is it Austria or is it USA? We've been to Austria's Mittersill Village and can honestly say you'll be hard pressed to tell the difference. Summer season in the White Mountains of NH is one of the rare treasured pleasures few folks find in life. You have just found it! Live like you are in Austria, without the long plane ride! Make your plans today. The front deck, with both built in bench seats as well as deck chairs, assures there is room for all to enjoy the fresh mountain air. 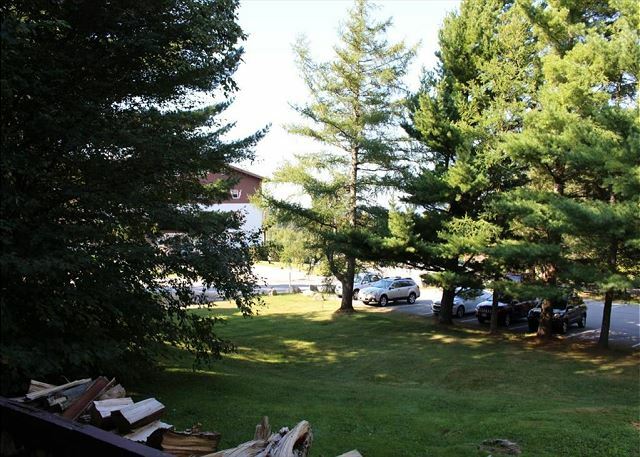 With a spacious yard, you'll get that privacy while still being close to the main lodge. During the Winter months, any given evening's sunset can result in this display of Alpine Glow colors. It's not just Fall Foliage where NH's Franconia Notch shows its colors; we are a four season location with outdoor activities for all types, at all times. As you approach the Mittersill Village entrance on a NH's Autumn day, this is what might be expected. 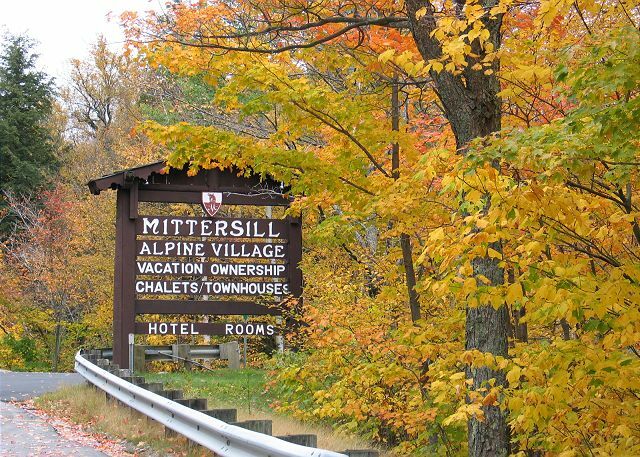 NH's Fall foliage is known as some of the world's best, and the Mittersill Village will put you in the center of a hard wood forest where the colors originate. The kitchen enjoys all new appliances and appointments that ensure an enjoyable experience for the cooks in the group, as well as everyone's hungry appetites. Lots of kitchen counter space makes meal prep and cleaning a snap. 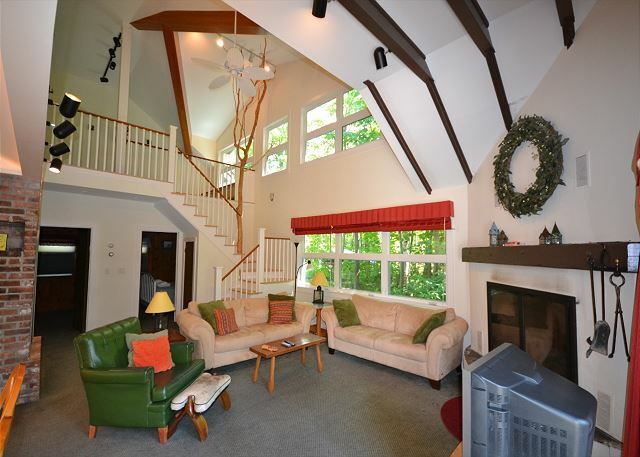 This bright and airy chalet will delight, with a real tree as the focal point of the home. Custom built and designed for family comfort and enjoyment. Tons of natural light flows through this Mittersill Village Chalet. Welcoming, warm and comfortable. 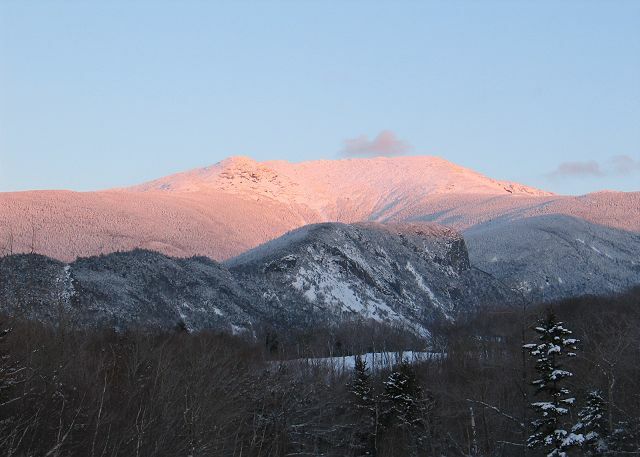 A great place to start your White Mountains adventure. The Master bath; brand new and magnificently done, you are sure to be wowed by the upgrades & improvements that have been made. 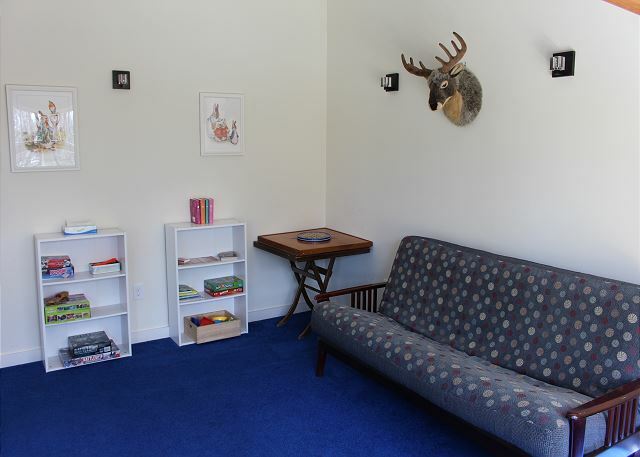 The loft area provides the kids their own space - with a selection of books, toys and games, as well as a queen size futon. Bench seating along the windows opens for any storage needs. 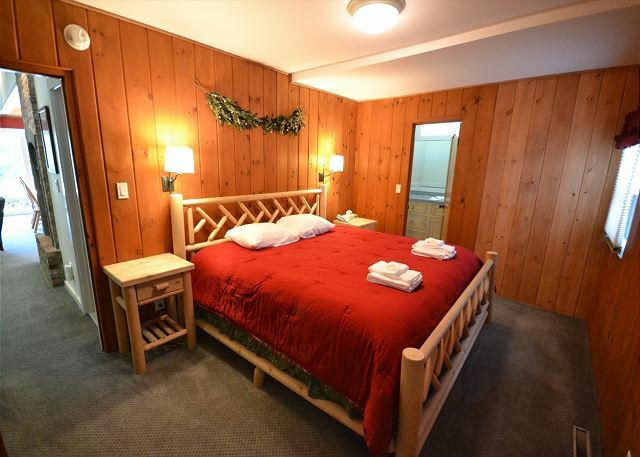 A Professionally Managed Franconia Notch Vacations Mittersill Village Chalet, the "Klebenov" Mittersill Village Chalet has satisfied many generations of guests, and having been recently fully remodeled and re-finished, it is ready to please many more generations to come. 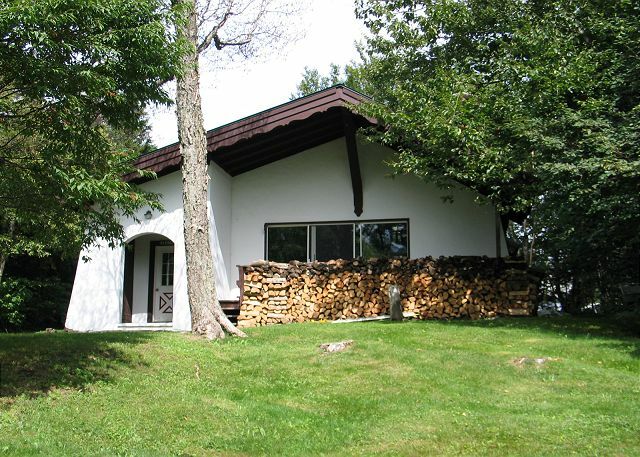 Professionally managed and fully prepared for each guests arrival, this home includes all the expected conveniences of a modern vacation, while maintaining its old world Austrian comfort & charm. The wide-open floor plan with sliding glass doors to the deck that features a gas BBQ grill, will be just one part of the enjoyment to be had at The Klebenov. 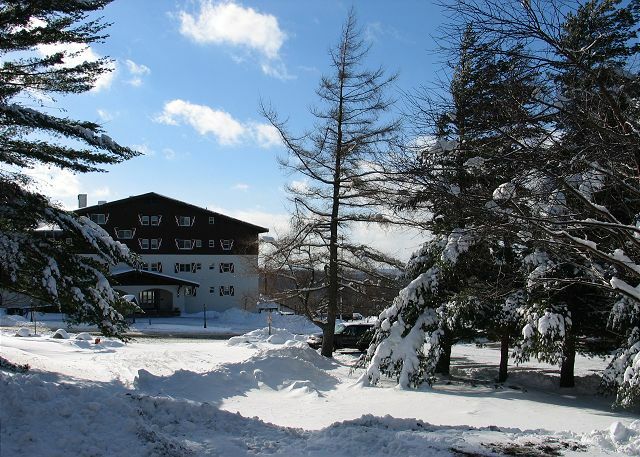 Being located less than 2 miles away from all that Cannon Mountain Ski Area & Franconia Notch State Park have to offer, such as 2100 vertical feet of skiing in winter or spending hours of enjoyment on Echo Lake in summer, will prove to be the best part! Call to make your plans today. This was the 2nd time that we have rented this chalet. Franconia Notch Vacations is very attentive to the renter's needs with excellent personal service. Loved this house. It was perfect for 4 adults, and 4 little kids. Great rental, hoping to return soon! Checkin/checkout with Franconia Notch Vacations was super easy even though we (unexpectedly) ended up checking in after-hours. The office is conveniently located just down the road. Inside the cabin was clean and well equipped (even with some unexpected extras such as a crockpot and stand mixer in the kitchen!) and even nicer looking inside than the pictures on the listing suggested. Furniture was well-kept and comfortable with the notable exception of one of the couches in the living room that had seen better days. Sleeping arrangements worked out well for our group as there was an additional futon in the upper loft that allowed the third couple to sleep together instead of the twin beds they were planning to use. If this is a new permanent fixture, it's a big plus! The queen bed in the non-master bedroom was on the hard side, so if you like a super soft mattress like I do be prepared to swap rooms or bring an egg-crate topper so you don't feel like The Princess and The Pea for your whole trip. The blinds in the bedrooms are the nicest blinds I've ever seen and I need to find some for my own home! They allow you to switch between near blackout and a soft-white glow which was terrific, especially given the morning sun. The large sliders, porch area, and gas grill were awesome given how nice the weather was during our stay, but the grill could have used a much better cleaning prior to our arrival. Being dog-friendly was excellent, but the provided vacuum cleaner sounded like it was probably broken when we went to use it. Luckily, given how much our dog friend sheds, we had brought our own vacuum which kept the carpet from ending up as 50% dog fur. Overall, super happy and looking forward to staying here again next year! We rented the chalet in august for our annual White Mountains get away. The chalet easily accommodated myself, my husband and our two adult children, plus one girlfriend, with space to spare. It was clean and well stocked. A beautiful home. Franconia Notch Vacations is a dream to work with, we love Cort and he is always professional and more than helpful! See you next August! 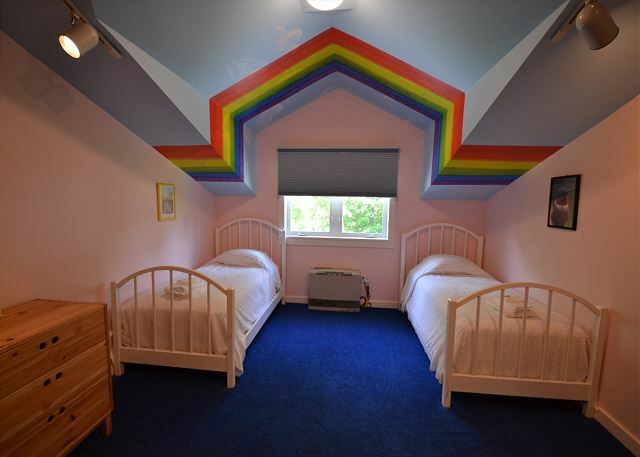 The property came as advertised, everything was in great condition. Check in/out process was first class. This was a great place to stay if you are skiing at Cannon/ Mittersill Mountain, literally within walking distance to Mittersill and a 3 min drive to Cannon main Lodge. 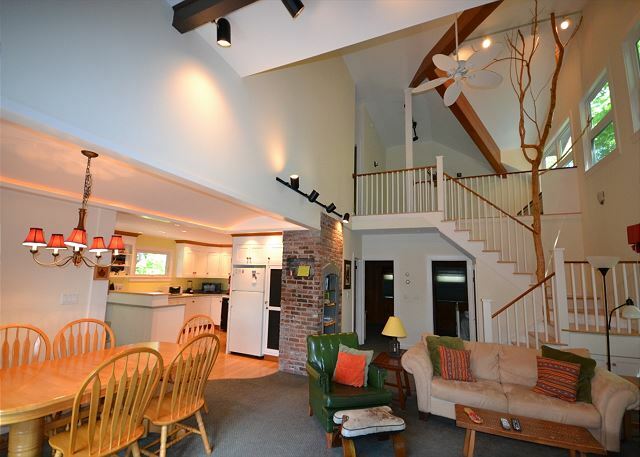 Would definitely recommend this property to anyone that will be up in the beautiful Franconia Notch area. We came up for a week of skiing at Cannon. We are a family of five (two 10 year olds and a 15 year old). Everyone loved the chalet experience and it was great being next to the mountain. Cort is easy to work with and all communications were clear. The Klebenov chalet reminds me of the 1970s chalet we used to visit in Switzerland when I was a child, so the old school decor did not bother us at all. The only drawback for me as a serious cook was the electric stove, as I am used to gas. Otherwise, the beds are all comfortable, the chalet was clean, the woodpile was stocked, and the views were great! Highly recommend. What a wonderful winter retreat this is. Our family so totally enjoyed getting to experience all that Cannon Mountain & Mittersill has to offer during our extended stay here. The weather is just so crazy & incredible at times. However the chalet is as solid as the NH Granite it sits on. Absolutely warm & cozy no matter how frosty & windy is was. we can't wait to do it again! Good location, rental just ok.
a guest from Ventnor City, NJ does not recommend this vacation rental. The chalet was located in an excellent spot. Good wi fi! The rental staff was professional and easily accessible. The only negatives about the property were the basement and the stains on the couch. The basement smelled noticeably musty and damp. Maybe a door would solve that problem. We thru our own sheets on the couches as we weren’t comfortable sitting on them as they were. Every year we look forward to our week at Klebenov. 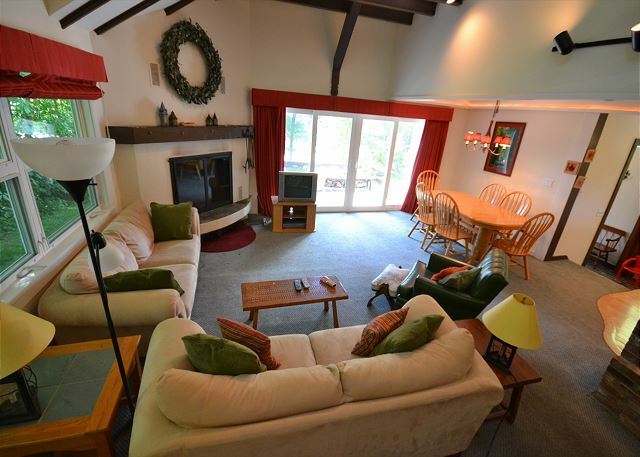 The house is well equipped and well laid out for a relaxing, fun, family vacation. From booking, to check in right through to check out, it was a lovely experience. Cort is always so helpful. The chalet was beautiful and well stocked, as well as clean and comfortable. Thanks all, see you again next year! Beautiful very clean and well maintained house. Central location within Mittersil Village. The booking process was very easy. Manger was very attentive to our needs. Would strongly consider renting again. We had a good weekend. House was clean and perfect for my two sons and their four kids age 9 to 14 and me.Problem no hot water our first nite. No firewood, we bought some.Water hot for nite 2. Overall a great time. We'll be back next yr. Comfortable for a family vacation. The price seemed high for the condition of the property. Thank you for having chosen our Klebenov Chalet for your trip to the 2017 NCAA Alpine Championships, and is great to hear that you all had a comfortable good time. Glad the races went so well along with!! It is with our regrets that maintenance had not caught the wobbly air on the dining chair, which is in repair, and that the starting supply of paper goods was lesser in quality than you would have preferred. What we have to offer is mostly intended to get you started though, and not as the be-to-all-ends for the stay. This mention made for the benefit of our future guests and what they can expect. Sincerely, CGR - Owner, Manager. It was excellent. 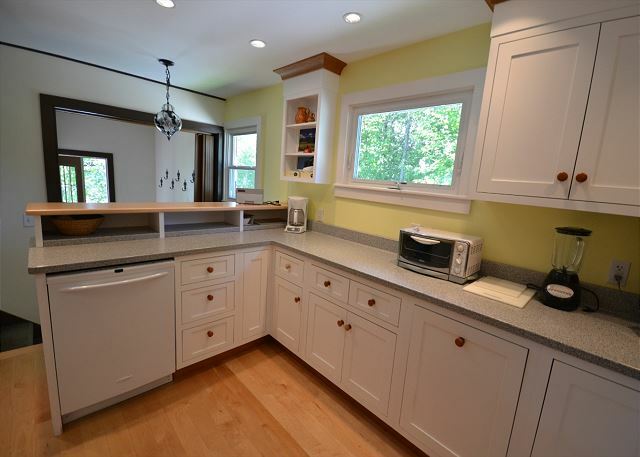 Great mattresses,warm bedding.super kitchen, dining table that fit us all to eat. Enough do fast and chairs to watch tv.only thing we missed was a TV in the loft to use the game console on, one to for all was a bit hard. Location was excellent and loved the fireplace! The kitchen could use a few more utensils but other than that, it was very comfortable. We had a wonderful stay at Klebenov. We had by Son and Daughter with their spouses and three grandchildren. The property was perfect. We enjoyed skiing back to the house for lunch and heading back out, sledding down the small hill in front of the house worked well for the 3 and 5 year olds. The home included everything we needed. We would stay again for sure. The only issue was we could not figure out how to watch movies on the DVD players or the VHS tapes. We came to work on the new race venue at The Mittersill Slope of Cannon Mountain, and this chalet was perfect!! Had everything we wanted, right where we wanted and the management company went to full length to be sure we had what we needed to get our work done. What a great set of races too! This house is truly a home away from home. We look forward to our stay every year. Had a great vacation. The chalet was clean well maintained. I'd definitely stay here again. Another excellent vacation at Mittersill - with the usual great service and preparation from Cort and FNV. This is a lovely chalet from top to bottom and we will be back! Girls trip for Fall foliage in NH and VT. Convenient to interstate and attractions. Beds slept good and everything was clean. Bring your washcloths though as that was the only thing not provided. Oh gosh... our apologize on the missed wash cloths here Mrs. Woodson. 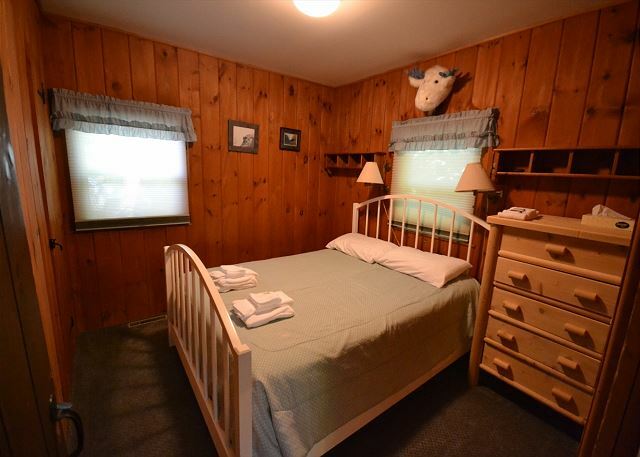 This was truly an "Oops on our end", as we DO provide a full set of towels (Face, Hand-n-Bath) for up to the maximum stated occupancy for the chalet. Somehow the linen set sent to house for your stay fell short. ;(. Sincerely, Cort Roussel, Owner-Broker, Franconia Notch Vacations. Generally, another great vacation at FNV. Gas grill was ok for hot dogs and burgers. Could use a new cook grate and the burner is on its last legs. Manager's Response: Well, would you take a look at that! 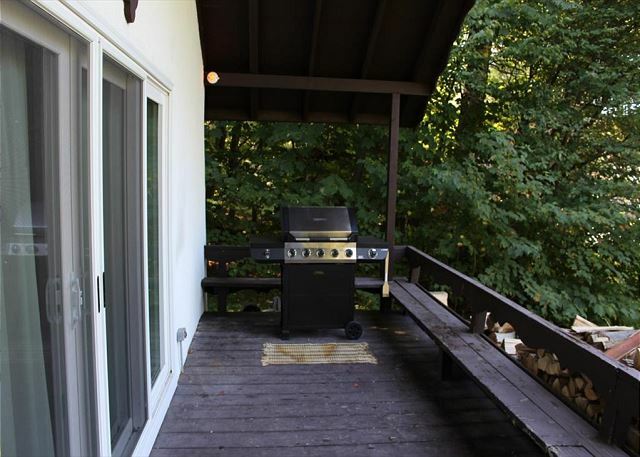 No really... go look at the photos of this chalet, because we updated them on 9.17.2015 to reflect the Brand New Grill that was purchased to replace the "well enjoyed one" that this guest review speaks to. The owner's heard your word. Thanks for helping us here Mr. Corbin!! Great pet-friendly house in a great location for skiing Cannon. Hey, Guess what?!?! Because of, and since this request, the owner of this chalet has ADDED CABLE & INTERNET to it, so next time Christine, and and for everyone else in-between, "You got it!". Thanks much for making the useful comment!! It worked. Home away from home! Perfect for a family to vacation with the comforts of home. The chalet was lovely and the new renovations are a significant improvement (we'd previously stayed there a few years ago). Certainly one of the nicest ones in Mittersill. There is one drawback which to us is significant and that is the lack of wireless (or any other internet). With no mobile coverage in area, anyone requiring connectivity should select a different place. Hopefully that gets sorted by next summer though as in all other respects it would be our preferred choice. We love this house and enjoy visiting every year. Recently remodeled. Great place with adequate space for 8 guests. We look forward to staying at Klebenov each year. The house is truly a home away from home. 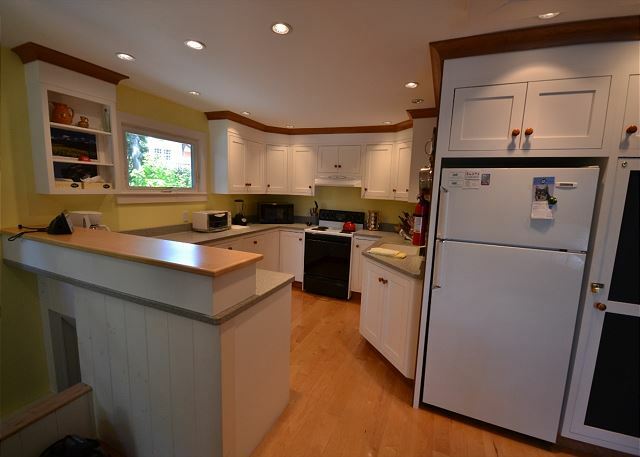 It even has a well equipped kitchen! The staff at FNV are a joy to work with. What a great vacation, there was plenty of room in this Chalet, kitchen and bathrooms were great! This was conveniently located within walking distance to Mittersill and the bar across the street, couldn't ask for much more. The water heater in the original house we were going to stay in broke down on the first morning of our stay. We called the management company, and since it was the holiday weekend, and noone was available to fix it, they offered us a different property. The exchange worked out to our benefit, since the second house was newer and located closer to the slopes. The conditions in both houses were great, although I am slightly puzzled by the design flaws. The first house had a toilet located on the main floor in the laundry room, but the sink was only in the kitchen. The second house had two bedrooms upstairs, but both bathrooms were located on the main floor. Franconia Notch Vacations works to live by a few short mottos that make all the difference, one of them being, "No surprises unless they can be good ones!" So, where ever possible, we will work to take the unexpected negative, such as a failed water heater, and turn it into a quick positive. Great tom hear we succeeded, thank you again for choosing Franconia Notch Vacations Mr. Michael. Great place In mittersal village, best for a family with kids or friends with lots of nice bedrooms. 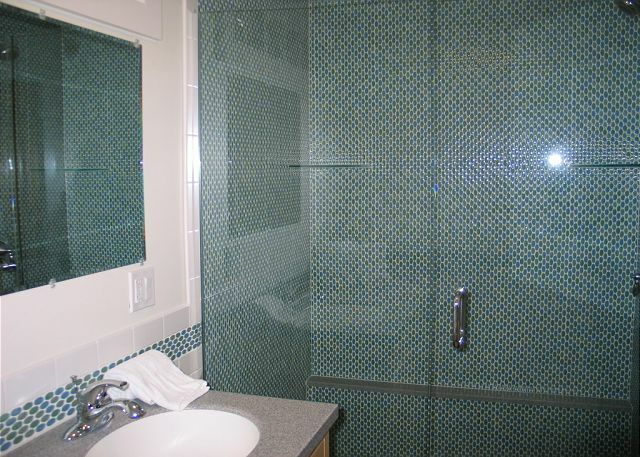 Especially master br and shower, best shower ever seen in rental. Cort at FNV great to work with also. Close to mountain and easy parking. No wifi but free across the street in bar. Will use again. This is the second year my friends and I rented through Cort, who is fantastic, from Franconia Notch Vacations and, as expected, had an absolute blast! The process of renting the property is extremely easy and the pictures depicted on the website is exactly what we walked in to. The house feels very private, yet its in a community so it feels very safe as well. The house is very spacious and clean and stocked with everything that we needed; of course we ran out of essentials, mainly toilet paper, but the market in town is only 4 miles away. The town also has a bank, hardware store and gas station, which is very convenient. As for the mountain? You couldn't get any closer. Cannon mountain is literally 2 minutes away and has awesome trails and a great lodge. In addition to skiing/snowboarding at Cannon, we went ziplining at Alpine Adventures, which was only 20 minutes away. Everything is very close to the properties, including the highway which makes travel a cinch. Overall, weve had a wonderful experience with this company and cant wait to book with them again next winter! What can we say other than ;-)! Thank you Donielle and Team Klebenov! Always great fun! Could've used some snow!! Six of us stayed at the Chalet for 4 nights. The location is great. House has a well equipped and updated kitchen. Our 3 kids loved the play area upstairs. WOuldn't change anything. there was a rusty truck parked in fron of the bedroom windows, and garbage containers - unsightly. other than that, ok.
To add a little 'insight' to this review... the chalet directly behind the Klebenov is under going some major re-construction (October 11, 2011) with the containers mentioned in this review being temporary and part of the said construction, to be completed by mid to late December 2011. Sorry these guests experienced the unsightly nature of the neighbors re-build, but we can assure you they got some truly outstanding fall foliage colors during this years Columbus Holiday. We had such a wonderful time! The place is in great condition, and Cort was so helpful. The playspace up top is wonderful for children and we loved the working fireplace. A few more dishes would be helpful, but overall the place is well equipped. I hope we can come visit again. We stayed in the Klebenov Chalet, and it was absolutely amazing! Our experience was fantastic, from the very beginning. Cort was incredibly helpful; and set us up with the best possible venue for our needs. He was always available when we had questions, and I felt confident going into the vacation that everything would run smoothly. Our house was beautiful, clean, and in an excellent location. I honestly could not have asked for a better vacation! We were so happy, we booked again for next year when we checked out! I would highly recommend using Franconia Rentals for all your vacations! They were great!! Beautifully redone chalet, can't beat the location. Bright & airy, most of the amenities (I bring my own knives and some other things I like to have), if any problems, property manager has been very responsive!! THERE WHERE 6 OF US AND WE ALL ENJOYED THE COMFORT OF THE HOME AND THE LOCATION WAS GREAT FOR THE AREA THAT WE TRAVELED. WE FOUND AVERYTHING IN GREAT WORKING ORDER. WE WOULD HIGHLY RECOMEND IT. .
Ice melting salt was needed in front of the door. Besides that, I don`t see how we could of been more satified. The location is great. Its practictly ski in ski out. Thanks. My family loved this chalet! It's close to the mountain, modernized and clean and very comfortable. Would definitely rent again. 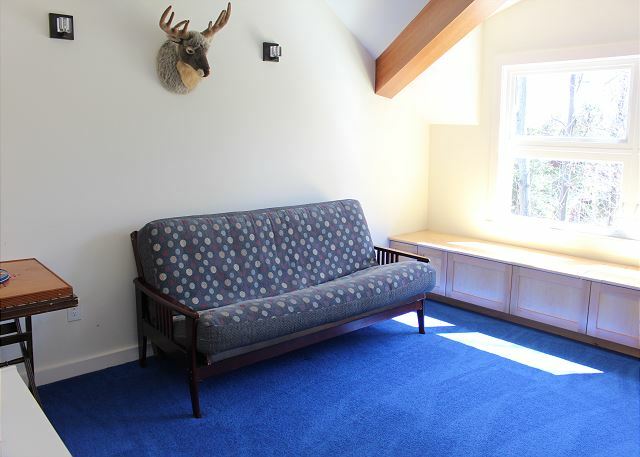 We liked the closeness to the Franconia Notch, the upgrades to the kitchen, furnishings and carpetings were good. Could use towel holders in the "master" bathroom. The biggest problem was the smell from the wet basement. We tried to keep the windows opened as much as we could, put the fans on to air it out but it did not help much. Maybe if there was at least a door on the basement it would keep the smell down. The rainy weather did not help, might be better in the winter. This is a great property for anyone who wants to stay very close to Cannon. The common area and kitchen of this chalet were very spacious and we had a great time hanging out here between days on the slopes. 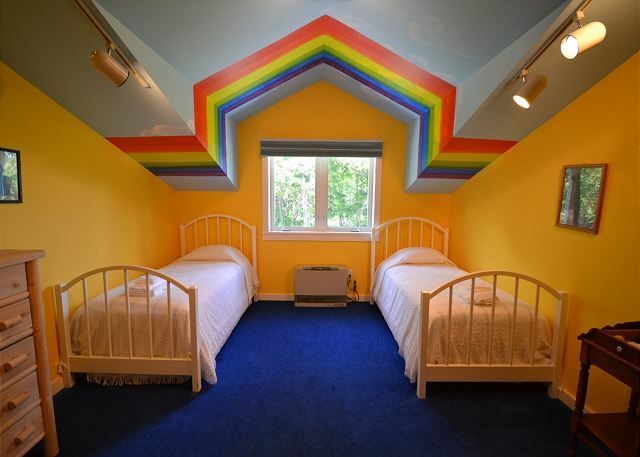 I would highly recommend this property. Master bedroom looks a bit not up to the overall conditions of the house. The Klebenov Chalet was a great place to take in the sites of the fall foliage in Oct. The Klebenov was remodeled in the last year and had new appliances, dishes, pots, pans, utensils, front loading washer/dryer. It is located in the Mittersill ski resort in Franconia NH in the White Mountains. We went in early Oct and took in the beautiful fall foliage. There is a lot to do in the area to include hiking, shopping, relaxing, site seeing etc. I would definitely recommend this area for a relaxing vacation. Now that we are back in Texas, we are missing the clean fresh moutain air. From booking our chalet and checking in to checking out we found them to be every accommodating. 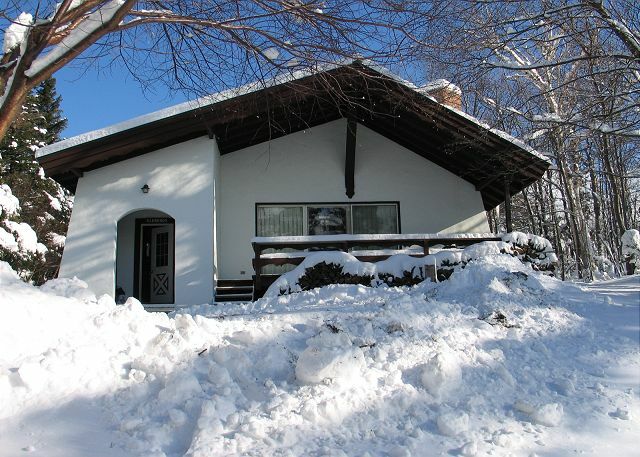 The chalet is beautifully kept and in a great location. I really didn't want to go home. My family and I vacation once a year in the mountains. This chalet will be where we will stay every year as long as it is offered for rental. We couldn't be happier. Thank you to Franconia Notch vacations and a special thanks to Cort.